Old faithful: Red-tailed Hawk (Buteo jamaicensis). You will see these all over the city, as often perched upon a human edifice as in tree. 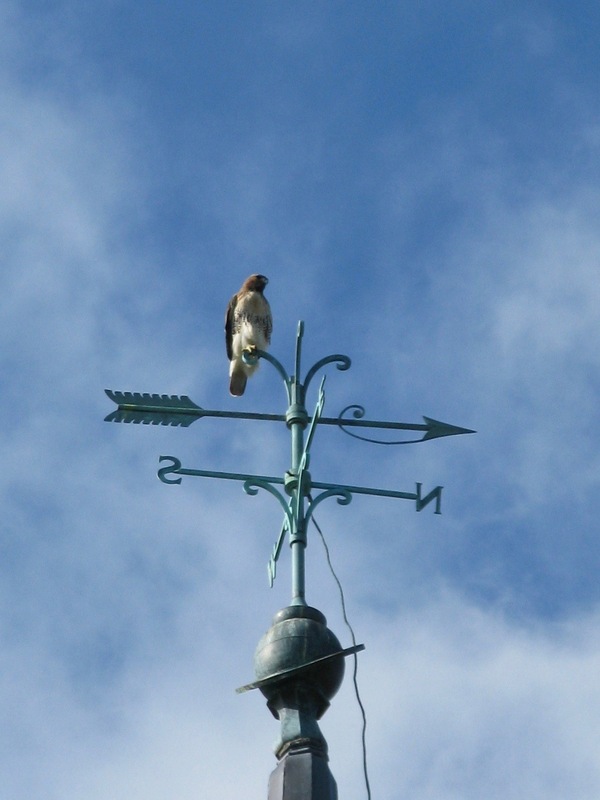 The guard at Woodlawn Cemetery’s Jerome/Bainbridge Avenue gate said there’s frequently a Red-tail atop this chapel’s steeple. Further into the grounds, I heard a Common Raven making that distinctive knocking sound they sometimes favor in their repertoire. I started moving towards the sound even though it was obviously distant. Just as I heard the last of it, I saw two more Red-tails in a conifer. After something more than an hour’s exploration, I exited by the same way I’d come in, and there was the steeple hawk, still in the sun. So, three RTHs on Thursday. On Friday, a pair were wafting around in the wind swooshing up the moraine at Sunset Park. I watched them in the cold park for perhaps 15 minutes, and then saw them a few times from the windows of the View From The Moraine the next hour. When they face the wind and seem to hang still in the sky, their tail and wings are constantly adjusting to the force of the wind. On Saturday, there were three individual hawks over Green-Wood. The first of the day was one of this year’s fledglings; they won’t get their eponymous red tail feathers until they’re a year old or so. The other two were both adults. A pair of Common Ravens were heard and seen as well. That was my first definite sighting of a Brooklyn Raven pair in a while. On Sunday, a large flock of pigeons erupted into the air above a crowded Washington Square Park and then a RTH floated mid-tree height to a perch. I was watching it as three youngsters with a camera seemingly named after Richard Leacock approached. They wanted to ask me some questions about art for a School of Visual Arts project. What kind of questions about art? Well, for starters, what is art? Are they still asking “what is art?” OMG, they were asking that when I was in art school in the 70s. I would think we would have moved on to other questions for unsuspecting passersby. I am curious about your response. You could write a JStor essay on the history of the question by art students of “what is art?”! I said art is whatever people say it is… but expressed a preference for things made by hand. The Red-tailed Hawk stuck around for the interview.